German thereminist Carolina Eyck has been busy lately! Between improvisations with guitarist Vinzenz Wieg, a new quartet, serving as the artistic director for the Theremin Summer Academy in Colmar, France, and performing with orchestras around the world, we're amazed and quite pleased Carolina was able to spend some time with us catching up. TW: The current theremin renaissance started in the early 1990's with the film, Theremin: An Electronic Odyssey. Is the theremin here to stay this time? CE: Yes, I think so. First of all there are more and more talented theremin players out there - I clearly see an increasing theremin-community. But it is also true, that the theremin – compared to other ‘new’ instruments like the accordion – is still a quite ‘unexplored’ instrument. Because of the obvious potentials of the theremin more and more composers get interested in writing for it. Now there are theremin parts in Symphonies and there are even Theremin Concertos by established composers like Fazil Say, Kalevi Aho or Lera Auerbach. 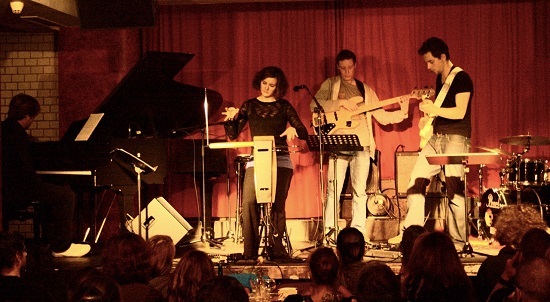 The theremin is not a ‘usual’ instrument you would use in an orchestra piece, but because it is so special and because there are people who can perform the theremin with virtuosity, composers like to use it in their works. TW: What defines you as a thereminist? CE: I like to combine singing with theremin playing. I practiced playing theremin and singing along in unison. I love modern music and jazz, so I am improvising a lot. This gives me the opportunity to try out the potentials of the theremin. There is so much that is unique to the theremin. For example I have found out, that I can make pictures audible by ‘painting’ in the air. The effect of combining these two completely diverse kinds of art, music and painting, is amazing. For me it is a completely new space of art, that I can explore only by playing the theremin. TW: You started playing the theremin at a young age. What would you say to other aspiring young thereminists out there? CE: Play with the air! The theremin does not have limits, so you do not need to bound yourself to the limits, that you maybe feel inside. And start playing with your favorite melodies. TW: Should young people be encouraged to try the theremin before learning another instrument? Or is it best for them to learn something like the piano or violin first? CE: You can start with the theremin first without doubt, but as you do not have ‘aids’ like strings or keys, it is very helpful to have a high sense of hearing. Of course it can be helpful to learn the notes on the piano. This can give a young thereminist a kind of security, surely useful in the beginning. But to be honest, I think that it would be the best for every musician, no matter what instrument he plays, to get in touch with music in different ways, with different instruments or with the voice, because every ‘instrument’ has its own way to open up your understanding of music. TW: What were some of the first songs you learned to play on the theremin? CE: It's quite hard to remember which pieces I played first on the theremin, since I started to play at so early age. I remember one piece I also played on my violin which was "Berceuse" by Alec Rowley. I thought it was lovely music. TW: Where do you see theremin music going next? CE: As the technique of playing the theremin is advancing in great strides, it will soon be possible to play even the most sophisticated music. Therefore I am sure, that we will see the theremin increasingly in use in all sorts of music, especially in new orchestral music. TW: What would your "dream theremin project" be? CE: That what I am actually already doing: I am playing as a soloist with orchestras, I compose and improvise solo or together with other musicians, and I am developing new music for my jazz band. TW: Do you ever use effects with your theremin? CE: I use effects a lot. At the moment I am working with delay, octaver, harmonizer and a loop station. TW: Which brands/models of effects are you currently using? CE: I currently use effects by Boss like: Boss RC-50 Loop Station, Boss DD-7 Digital Delay, Boss OC-3 Octaver, Boss PS-6 Harmonist. Since I've been playing with effects for only one year now, I'm of course still looking for other effect units. It's a fun thing you can add so many new colors to your playing. TW: What qualities do you look for in a good theremin? CE: There are a lot of requirements for a good theremin, and it is difficult to find one, that satisfies all of them – most actual theremins have a restricted playing range, unequal tone spacing, sensitivity to external RF interference from other electronic circuits nearby, temperature sensitivity and technically limited expressivity. The weight and dimensions of the theremin could also be improved, as I am traveling a lot with my instrument. TW: When performing with an orchestra, are there any unique factors that make playing the theremin more difficult? CE: It is most crucial, that you can hear yourself while playing with an orchestra. Therefore I always need a good monitor speaker. TW: What's next for you? CE: There are so many different projects in future like composing for my jazz band, performing with orchestras, choirs, other musicians, preparing for festivals like the LuostoClassic in Finland… There is so much to do, and I am always short of time. I want to publish a revised and extended version of my method book ‘The Art of Playing the Theremin’, I need time to paint, to recover, to meet friends. I love doing whatever comes next! Be sure to check in regularly on Carolina at her website (www.carolinaeyck.com) and her Facebook page (www.facebook.com/carolinaeyck). You can find her music at Amazon.com , iTunes, and other online retailers.